Going out, whether plunging headlong into the action of the streets and the winking lights of a Friday night, heady with potential, or into the sunlit early morning immanence of a row of marching brick-built houses, about to despatch their occupants out into the world – can be one of the most basic and exhilarating joys of city life. This simple, life-affirming act doesn’t even require a particular purpose or destination, although it can help. When Virginia Woolf felt the call of the city, as famously described in her 1930 essay ‘Street Haunting: A London Adventure’, she gave herself the excuse of buying a pencil. This allowed her a framework of sorts, within which she could permit her ‘self’ the freedom to be ‘blown about at so many street corners, which has battered like a moth at the flame of so many inaccessible lanterns’. But sometimes, on some days, it’s better to avoid all that. 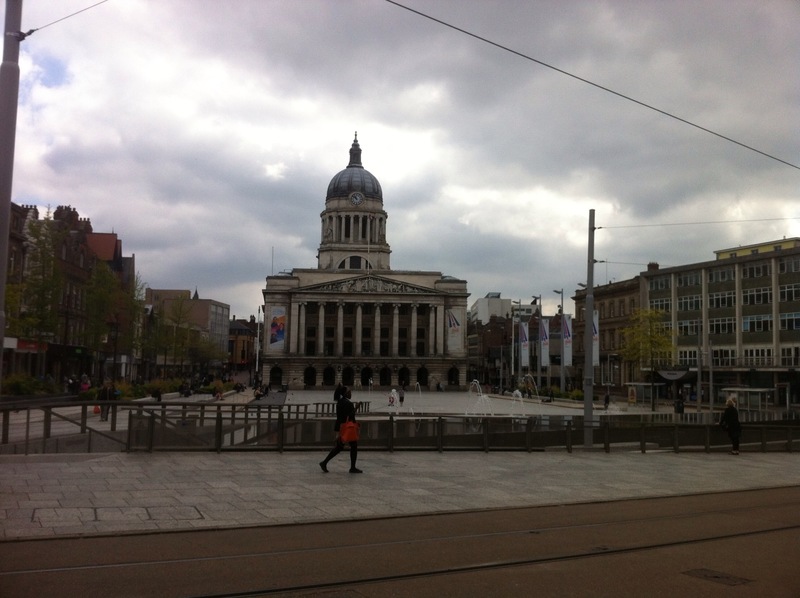 I recently went back to visit Nottingham, where I’d been a student in the early 1990s. Apart from conducting an audit of the pubs we used to go to, I wanted to retrace the steps of a walk I often took that deliberately skirted around – or through to be more exact – the city centre. Sometimes, being in the middle of a city and finding a way of evading other people, bustle, and noise, can be even more satisfying than putting yourself in the heart of the action. My initial impression, as I walked up from the station on a Saturday morning; through the Broadmarsh Centre, up Lister Gate, along Exchange Walk and into Old Market Square, was that the economic climate gifted to us by our beloved gambler-bankers was not being kind to the Queen of the East Midlands. Lots of units in the shopping centre were boarded up, even the usual high-street suspects weren’t exactly buzzing and the proud edifice that is the Exchange Arcade and Council House was looking a little jaded. That evening back in the centre and in Hockley, Arthur Seaton’s great-grandsons and daughters were still out in force looking for a good night out, but some of the bars and pubs seemed a little too keen to pull – offering cheap drinks to all and looking like their glory days had been and gone, leaving only empty beer glasses to mark their passing. Yates’s and The Bell were still packing them in though. 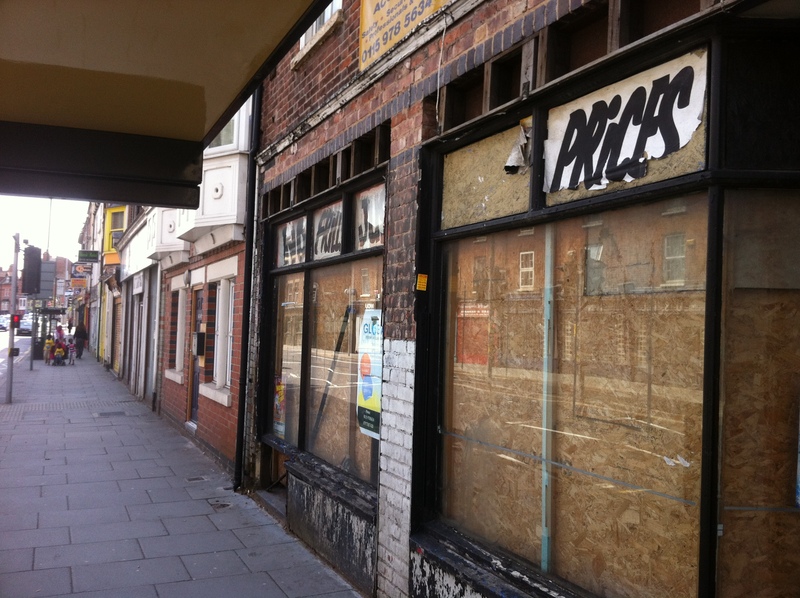 Sunday morning, at the junction of Derby Road and Alfreton Road – complete with more boarded up shops – I headed for my old Nottingham not-quite escape route. Tradition has it that if you want to avoid the city streets and traverse Nottingham by other means, the best way is to go underground. Although not quite as celebrated as Brian Clough and Robin Hood, Nottingham is also famous for its sandstone caves. Local lore maintains that it’s possible to move between the Castle in the south to the north of the city, via a series of man-made caves and tunnels, taking in Anglo-Saxon caverns, medieval vaults, pub cellars, conduits and tunnels. You can now explore Nottingham’s cave’s virtually through the fascinating Nottingham Caves Survey – a project that aims to map every cave in the city. The site features a map, 3D fly-through videos, photos and virtual tours. Even a quick glimpse at the map brings home just how extensive Nottingham’s subterranean city is. To explore the caves in person, you’ll probably need an official tour or guide. 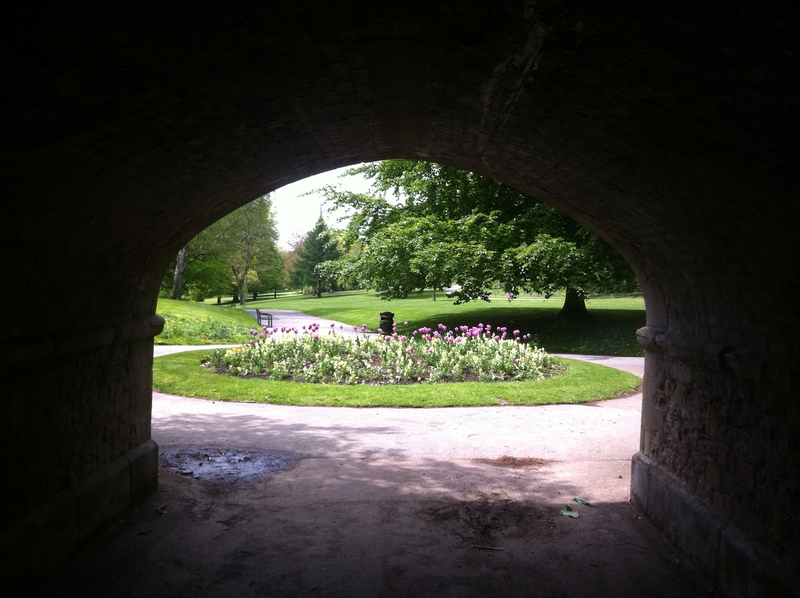 In September 2013 an intriguing new way to do it was launched; Sidelong’s A Walk Through the Underworld is “a collaboration between artist Jo Dacombe and Laura-Jade Klee, exploring the idea of curated walks.” The project is supported by a range of local interest, arts and caving groups along with The Arts Council. There are still a few places available for what promises to be a unique opportunity to gain access to the caves and tunnels under Nottingham. At the time of writing the funding is still a little below the required target, so if you like the idea, help ensure the project goes ahead, by finding out more from the link above, or at the end of this post. Back when I lived there, unless you got particularly friendly with the landlord of The Dragon, the only easy way into this stygian world was by paying for a tour of castle rock or for ‘an experience’ that began behind a plasticised door inside the Victoria Shopping Centre. 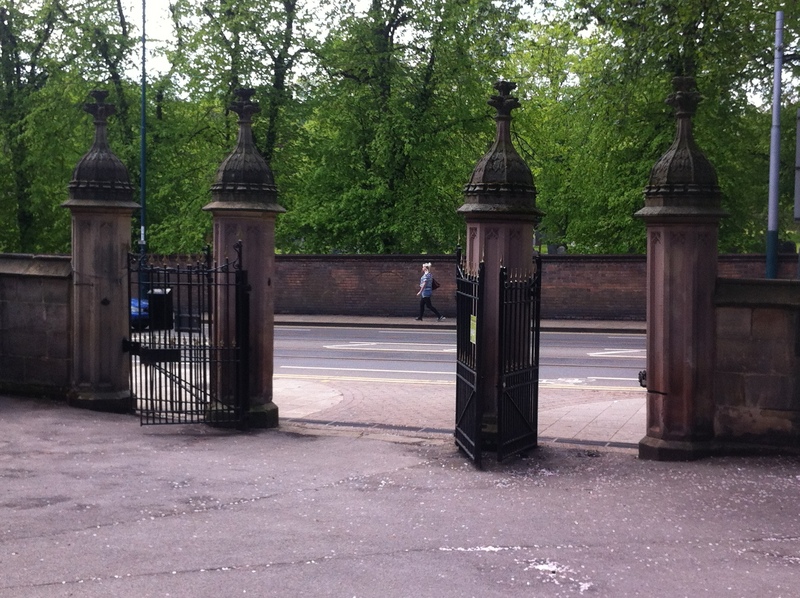 So my then alternative route through the city was via the General Cemetery, where without fail The Smith’s ‘Cemetery Gates’ would spring naggingly to mind whenever I approached. I have a similar problem with Victoria Station in London, which I can’t pass through without hearing an internal version of Mark E Smith singing The Fall’s cover of The Kink’s ”Victoria‘. As a student I was attracted to the place initially by some vague notion of Gothic romance, I quickly came to discover that this was no ivy-clad, vampire-haunted, graveyard in the manner of Highgate urban-legend. This cemetery was well looked after and pleasantly dotted with various gnarled, but not too gnarled, trees. 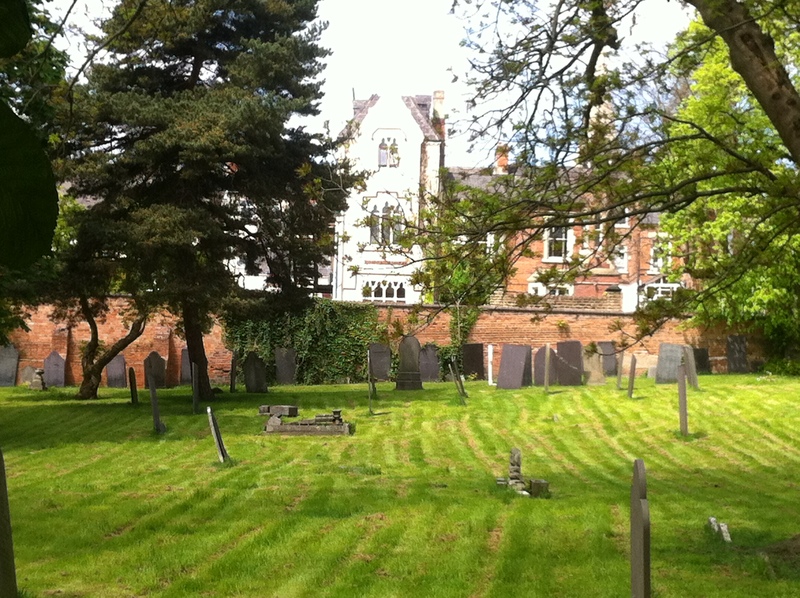 In fact if it wasn’t for the headstones and high brick walls you could easily mistake the grounds for a park. 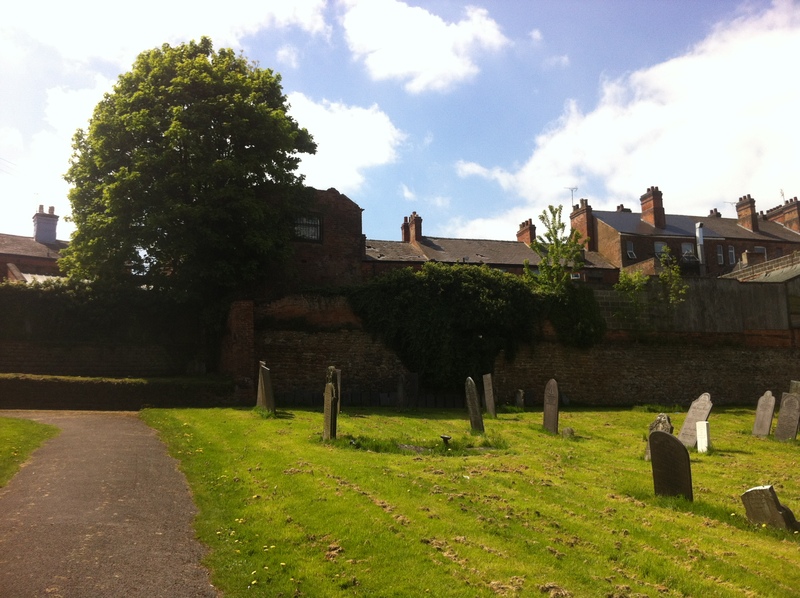 Having said that I often wondered what the people living on Cromwell Street whose houses overlooked the North west side of the grounds might see if they peeked out of their windows at night into the moonlit graveyard. 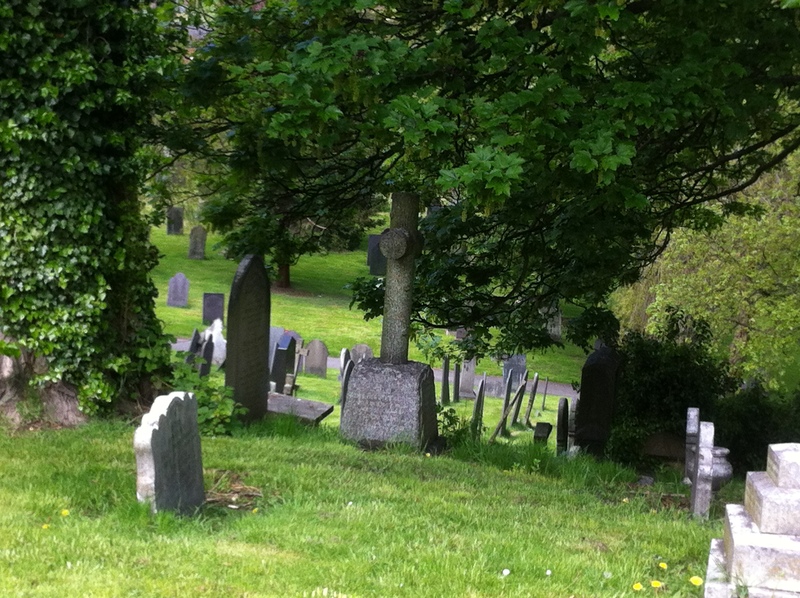 The mundane reality was probably a fox or two, and for real excitement people swigging from cans of Special Brew, though I still preferred to imagine scenes more like those from MR James’ short story ‘There was a man dwelt by a churchyard’. 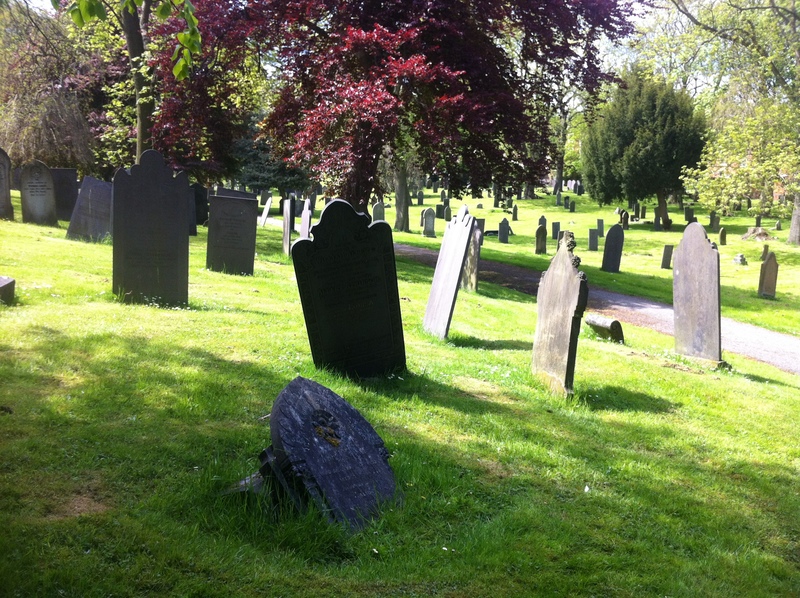 The cemetery runs almost directly into a park – The Arboretum, a short step across Waverley Street. 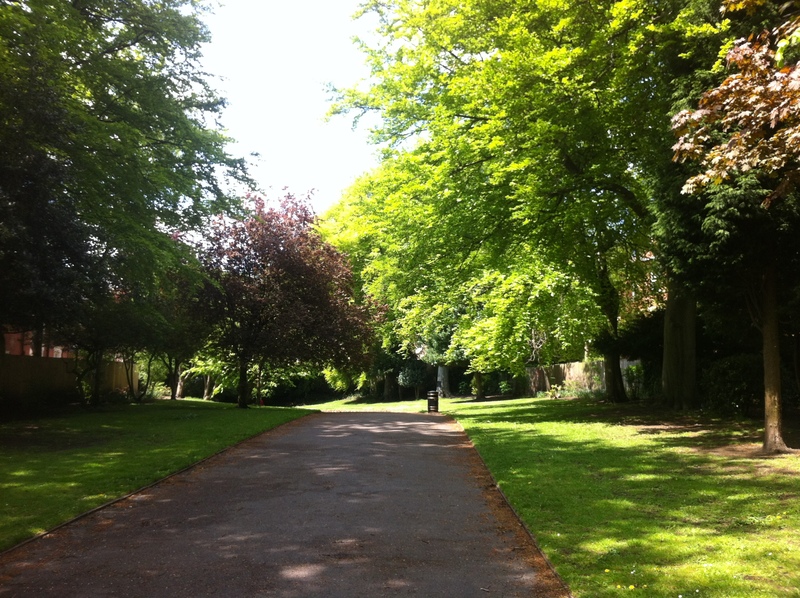 Nottingham’s first public park, designed by Samuel Curtis and opened in 1852, is a fantastic space, laid out with winding pathways, wide lawns and little hills and rises. As well as a fine collection of trees – around 800, with examples of over 200 different species – a tunnel, duck pond and monumental cannons, the Arboretum contains 9 listed buildings, including the graceful curves and twisting frames of the Aviary at the southern end. The Arboretum is also said to be the inspiration behind Peter Pan’s Neverland. Proof of a direct influence has never been found, but J. M. Barrie worked as a journalist on the Nottingham Daily Journal in the early 1880s, and for 18 months lived close by the Arboretum on Birkland Avenue, off Mansfield Road. His daily walk to work would take him through the park and past the pond that just may have triggered thoughts of the original Mermaid Lagoon. The Arboretum remains a beautiful park and is real oasis of colour almost smack in the middle of the city. 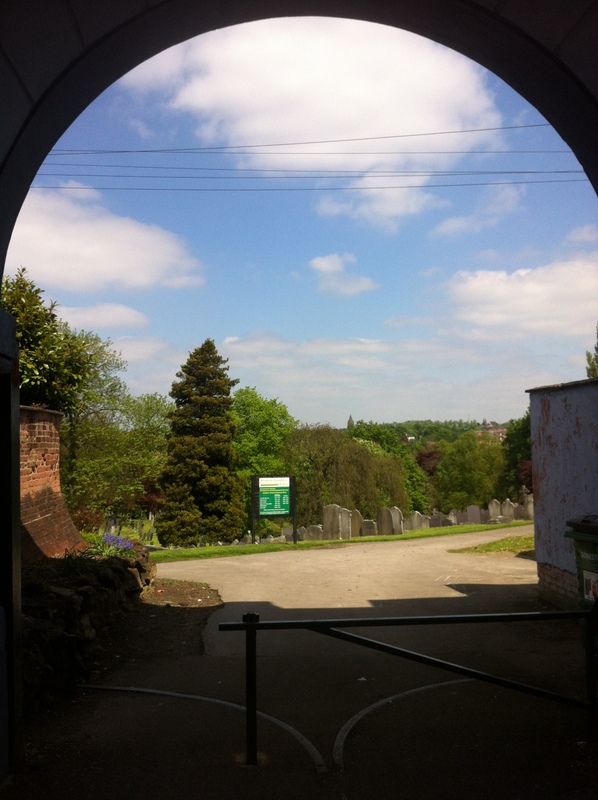 Together the cemetery and The Arboretum make a peaceful, green, alternative route through the city, moving from Canning Circus – at the top end of Nottingham’s student dominated suburb of Lenton to Mansfield Road, without taking in a trudge down Derby Road. An added bonus used to be a stretch of Mansfield Road at the other end, with several decent record stores and a second-hand bookshop. This is reached by a narrow, tree lined corridor through, connected by a tunnel to the main body of the park at its northern end. Bounded on both sides by houses, this little stretch is a kind of urban isthmus reaching out from The Arboretum – but surrounded by buildings rather than water. It’s the last gasp of the park stretching out a green tentacle, leading out to the city, or inviting it in. The record and book stores may still be there, but I didn’t check. After seeing a few pubs that I once liked had closed-down, along with various boarded up shops in the centre, I couldn’t bring myself to do it. I hope some of them have made it, but at least the cemetery’s still there.